Here’s a quick and delicious addition to your Easter feast this weekend! Small, sweet English peas are anything but old fashioned when tossed with bacon and a bit of crème fraiche. 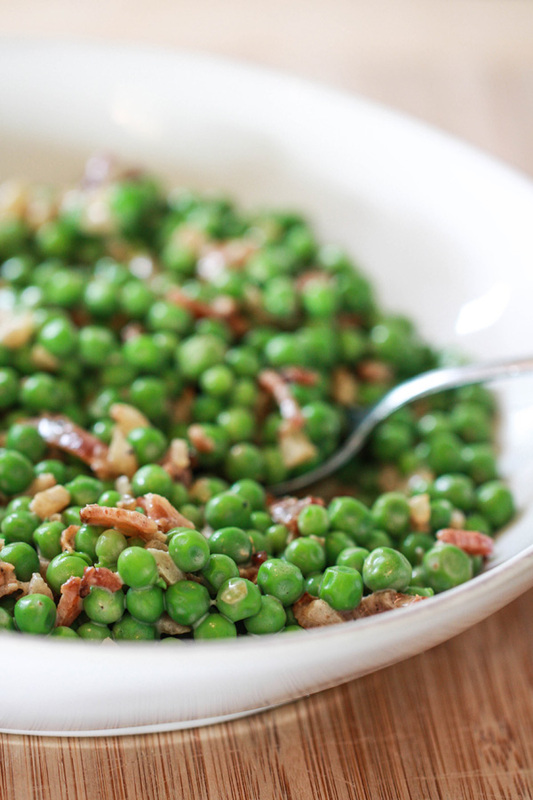 These peas are only available for a very short time in the spring, making them an ideal Easter side dish. 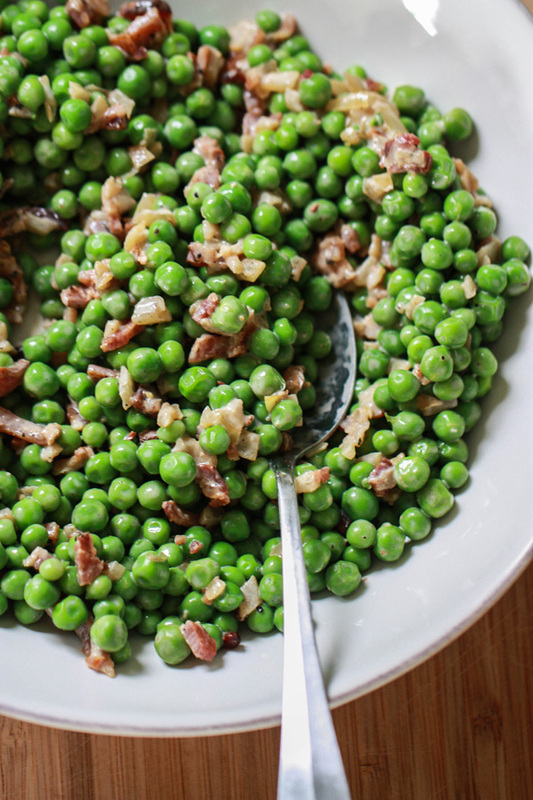 These peas were so delicious that I am re-making them this weekend when I cook Easter dinner for a bunch of friends. They really only take about fifteen minutes to make, start to finish, but are so flavorful and delicious that your guests will ask for seconds. Crème fraiche is a French version of sour cream. It’s a little less tangy than the American version and I’ve found that a little goes a long way! Look for it at your local grocery store but if you absolutely cannot find it, sour cream makes a worthy substitute. Small, sweet English peas are anything but old fashioned when tossed with bacon and a bit of crème fraiche. Bring a large pot of water to a boil with a pinch of salt. Once boiling, add the peas and boil for 2 minutes. Drain immediately and run cold water over the peas. Set aside. Fry the bacon over medium/low heat in a cast iron or heavy skillet. Once crisp, remove the bacon and crumble. Set aside on a plate. Discard all but one 1 tbsp of the bacon grease, and then add the onion to the hot grease. Saute onion for about five minutes until soft and translucent. 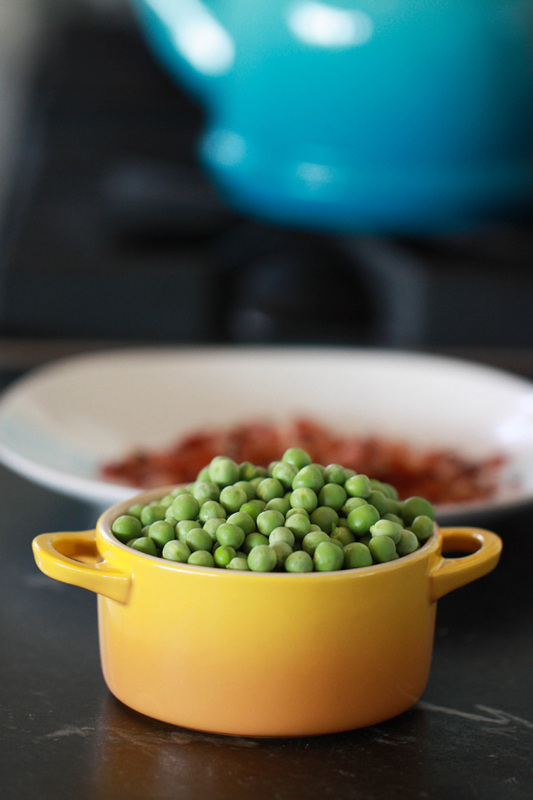 Place peas in a large bowl. Add bacon crumbles, sauted onions, the crème fraiche and salt and pepper. Toss well and serve.